Blueberries are not only great tasting; they are a fiber rich, low calorie berry oozing with health benefits. They are full of anti-oxidants, specifically anthocyanins, which go around the body repairing cellular damage. This is important to balance the negative effects of stress, environmental toxins, poor dietary choices and lack of exercise. One cup of blueberries contains 3.6 grams of fiber. Fiber is important to mediate rapid rises in blood sugar levels, absorb cholesterol, hormone metabolites and toxins and remove them from the body. Berries have a low glycemic index, meaning they do not trigger a fast rise in your blood sugar levels and are thus a great addition for diabetics and anyone working to control their blood sugar levels. A study published in 2011 by McAnulty et al, showed that a daily consumption of blueberries for six weeks raised Natural Killer T-cell (NKT) counts. Any dysfunction with these cells in your body has a significant impact on your immune system, especially your ability to fight off cancer or develop an autoimmune condition. The same study also showed that immediate ingestion of blueberries decreased oxidative stress while increasing the anti- inflammation mediators in the body. This is significant for EVERYONE, and extremely helpful for recreational and professional athletes. By adding blueberries to your post workout smoothie, snack or meal you can recover faster, more completely and suffer less muscular deterioration from your workout. 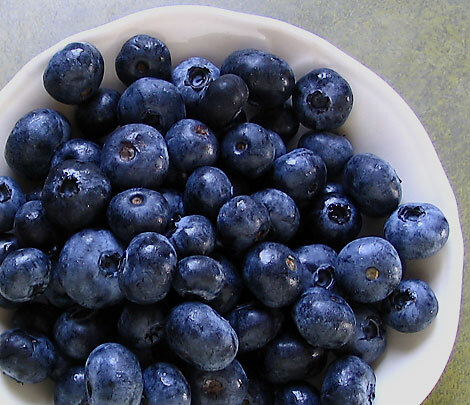 Blueberries are a low fat, higher fiber food that is local, healthy and tasty. Add them to your daily routine and feel good about it! 1. Appl Physiol Nutr Metab. 2011 Dec;36(6):976-84. Epub 2011 Nov 23. McAnulty LS, Nieman DC, Dumke CL, Shooter LA, Henson DA, Utter AC, Milne G, McAnulty SR.
Blueberries are not only great tasting; they are a fiber rich, low calorie berry oozing with health benefits. They are full of anti-oxidants, specifically anthocyanins, which go around the body repairing cellular damage.